This entry was posted on Thursday, March 19th, 2009 at 11:24 pm	and is filed under Almost Meatless, Appetizers, Main Dishes, Mexican, Spanish. You can follow any responses to this entry through the RSS 2.0 feed. You can leave a response, or trackback from your own site. Oh yum–these look awesome! I’m definitely going to make them! I thought Albondigas was traditionally a soup…but this sounds more like a saucy appetizer than a soup, eh? 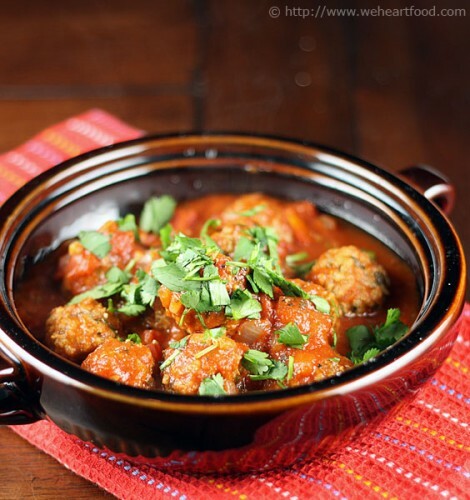 That’s the Mexican style of serving albondigas — in a brothy soup. These lean toward the Spanish style. One nice thing I’ve discovered about this one is that doubles and freezes perfectly! Thanks for posting about our book!! !